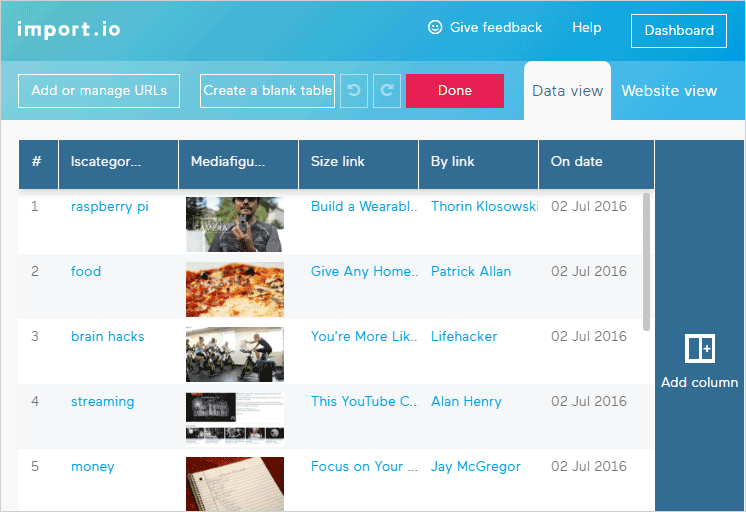 In this post, I will share with you, four best free web scraping tools for non-programmers who want to create insightful data-driven content without hiring a programmer. I’m frequently using them to fulfil my web scraping tasks. I know there are many software tools out there but these four FREE software tools I consider to be the best for basic scraping of websites, Facebook and Twitter data into Excel spreadsheets. 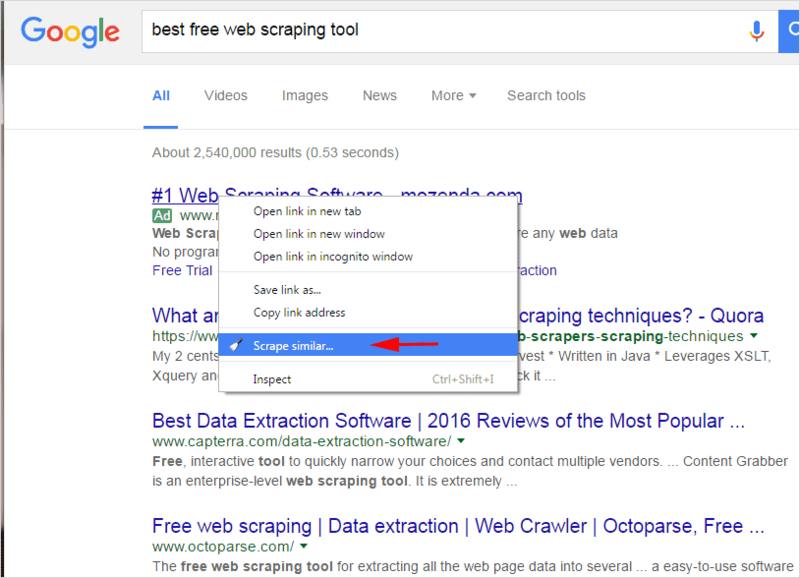 This tool is simple yet very useful for quick single page data scraping into a spreadsheet, but you will need to have Google Chrome browser installed in order to use it.This tool will make you start loving data scraping.Let me show you how to use. If the extension is successfully installed, right click on any page on your browser. You are supposed to see a window like one below with “Scrape similar” being one of the options.If you can’t see it that means the extension is not successfully installed. Let us put it into use and scrape some data. For example, I want to scrape the page titles and URLs of Google search results page returned for a specified search keyword query. Point the mouse cursor to the data (in my case page title) you want to scrape and right click then select Scrape similar .The scraper will return the scraped data with options to copy to clipboard or export to Google Docs. This tool doesn’t offer many options and sometimes it is not that efficient, but for simple tasks, it is very handy.You can make it more effective by using XPath,Columns and Filter on its interface.I will not cover how to use Xpath today. You can watch below video to learn more how we can use XPath to make it more efficient.Also, you can refer to XPath Quick Reference document to find out more about XPath. By using Facebook and Twitter APIs you can scrape massive amount of public competitor data and analyse what is working for your competitor or in your industry. API is an interface or way which allows third party software tools to access Facebook massive amount of Social Data programmatically. Access to these APIs is mostly free. I created separate tutorials on how you can harness these APIs without you writing a single line of code. Import.io is the web scraper of my choice.It is a very powerful tool.You can use it for crawling or data extraction.You can use it to extract data from multiple URLs and you can create APIs also for integrating into other web applications or to extract data again if the data source has been updated. Magic – It’s an online web data scraper tool – no setup whatsoever, you can get results in few seconds. Extractor – Lets you choose the data that you want from specified web pages via simple point-and-click – precisely the way you want it. Crawler – Explores the website to find all the data that you want from similar pages – handy if you don’t know all the URLs. Connector – Lets you record a sequence of actions, such as a search, within a website to get to and extract the data that you want – Extractor with a macro. The service and data are 100% free. Forever. 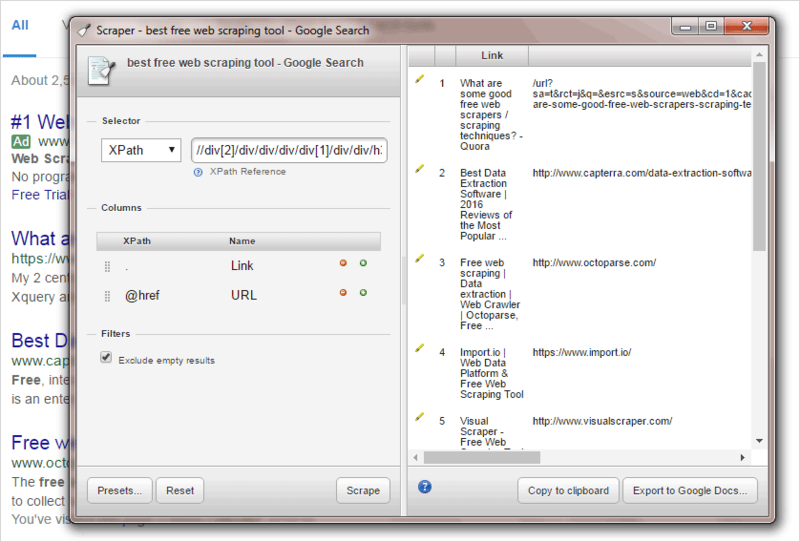 This method above will let you extract only some few pages using Magic tool.To make it super efficient and obtain massive data you need to use Extractor tool.In my previous post, I have created a visual step by step tutorial Web scraping for dummies tutorial with import.io where I extracted all blog posts URLs and identified how much social shares each URLs has received.You can check it. Kimono Labs is almost similar in functionality to import.io. These four free tools will get you started with web scraping to suit your different purposes.They are clean and easy to use, and they have a lot of support tutorials online.Also, don’t forget to check their blogs to learn different ways you can use them to do web scraping. If you have any question or suggestion, please leave me a comment below.